Also on beunited.org (see post just below this one), Cosmoe 0.7rc12 is now out, and has included the SDL as the graphics library, which adds a whole new world of functionality to Cosmoe. While not yet an R5 replacement, it’s getting there. Help test, Download it and try it out! 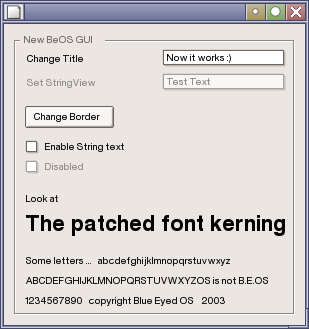 BeOS Journal caught the news on beunited.org about an update to BlueEyedOS, with an updated font rendering system and a new screen shot. Check out BeDoper for the recently unclassified details. Was over on the OpenBeOS site’s forums, and noticed that BeOS Max Edition has hit the Sourceforge Top 10 Downloads at number 5! Seems a V3 Beta 1 version was released quietly on the 15th of June, and it’s been getting a ton of downloads. Way to go!!! So, title says it - Go read it! PalmSource has absolutely 0% interest in BeOS. Their “execs don’t even remember they actually own the Be IP” someone in the know told me once. Knowing how they were when beunited.org tried to get a license, I find it quite fortunate that yellowTab was able to license the code at all and save the OS for the community. Support them! Besides, it’ll be a while before we have an open source offering - and I know you all need an updated OS out there! (Aside the fact that yellowTab has plans to incorporate OSS solutions into Zeta, so it becomes a distro of sorts as time goes on anyways). Cosmoe, the “Compatible Open Source Multi Operating-system Environment” created when Bill Hayden forked the atheos app_server, put it on top of the linux kernel, changed the API to be BeOS-like, and started attaching other api’s like openstep/cocoa, and the linux standards, has a new release. This release, 0.7rc3 is a “close to ready” 0.7 release which has a few more bugs. Most of the work since the last release has been internal, and involved nearly rewriting libcosmoe from scratch based on the openbeos codebase. Yes folks, they are sharing. This is why free software rules. In any case, go check out the new release if you are so inclined. If it’s good, consider helping out. You can read the complete announcement simply by clicking the read more link. Congratulations Bill! Looks like OSNews got a copy of the yellowTab 5b beta. They have posted what they call a “WORLD EXCLUSIVE” first look at yellowTab. It is a bit more indepth than anything we have seen so far, and does get into functionality and behavior, as it is hands on. Most of the news to this point has been screenshots and second hand accounts of behavior in demos. So it’s definately worth a read.